Steer clear of artificial sweeteners. 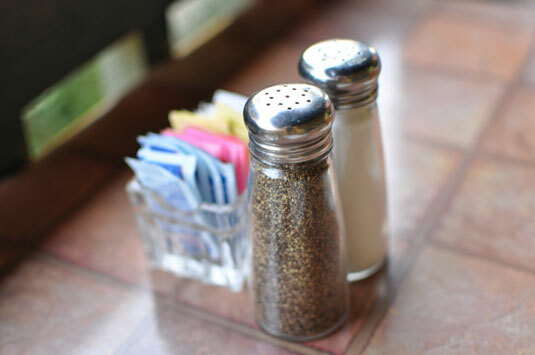 Whether or not you have IBS, you may have replaced some sugary items in your diet with an artificial sweetener in an effort to avoid sugar (perhaps as a calorie-counting measure). However, these artificial sweeteners can have as much of an effect on your IBS as sugar does. Although studies may show these substances to be scientifically safe, many people still report reactions. 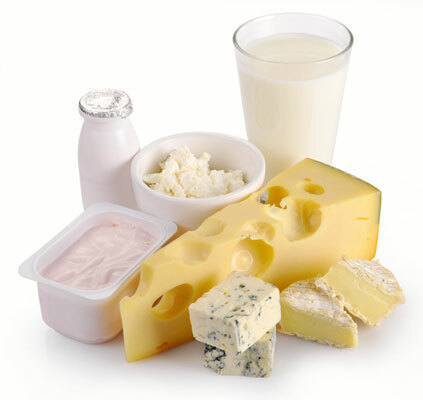 Dairy is the first food group to avoid when you have a symptom flare-up. Dairy-digesting enzymes are most active and plentiful in infancy and decline after weaning, so many adults don’t have enough of those lactase enzymes to digest dairy products. Even when you’re flying along without problems, you should eat dairy only once every three days, but introduce it in reasonable ways — don’t pound back a cheesecake to celebrate the liberation of your colon. 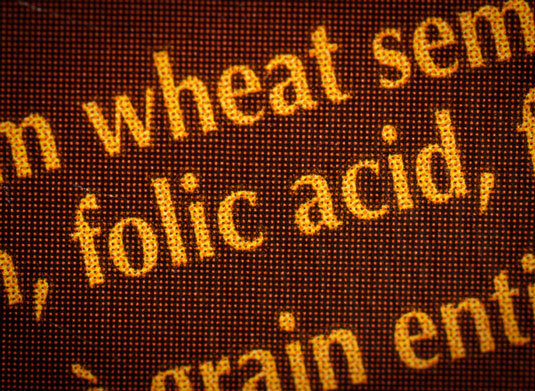 You may have eaten wheat three times a day for decades and not even given it a second thought, but your bowels have calculated every wheat particle and are coming up with an overload. 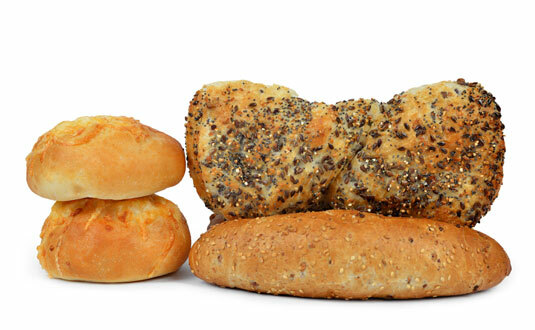 One way to weaken wheat’s hold on you is to stop eating it altogether for two weeks. Then you may be able to eat it once every three days, but let your bowels be the judge of that. Any kind of rumbling in any part of your gastrointestinal tract (GIT) may be a sign to back off the wheat. When you have a sensitive stomach, the last thing you need is to expose yourself to the parasites that are fairly common in raw fish. If they’re microscopic, and some of them are, nobody’s going to notice them decorating your raw tuna or salmon. And don’t count on the heat from the wasabi to kill any lurking bacteria — that’s a myth. Eating cooked or vegetable sushi may not keep you out of the woods either. 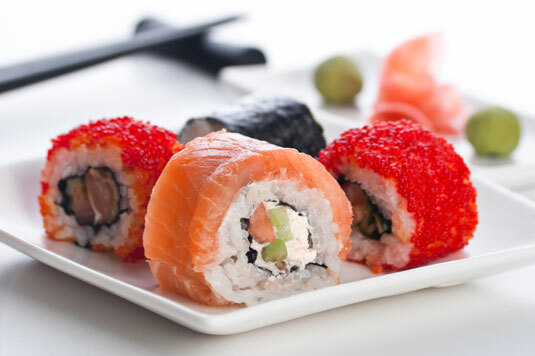 Even if the sushi chef keeps a spotless work area, raw fish bits can creep over into cooked fish. You may be tempted to grab a $12 tub of popcorn at the movie theater, but even if fat isn’t an issue for you, this stuff has the fat power to launch its own IBS attack. In fact, a large tub of buttered movie popcorn can have as much as 125 grams of fat. That’s more than double the recommended daily amount for an adult with a high-functioning GIT. Fat isn’t the only issue with popcorn: It’s simply impossible to chew down the insoluble fiber particles of popcorn that can irritate a sensitive gut. 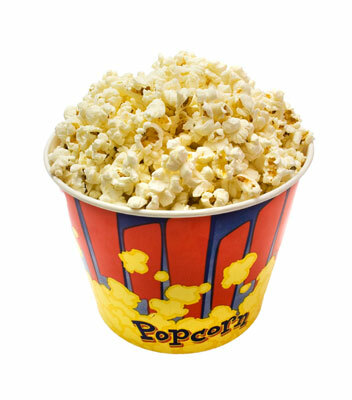 Have you ever found popcorn casings lodged between your teeth days after having eaten popcorn? Imagine those bits lurking in your colon. If something has survived in your mouth for three days without ever showing signs of being digested, you simply don’t want to go near the stuff if you have IBS. 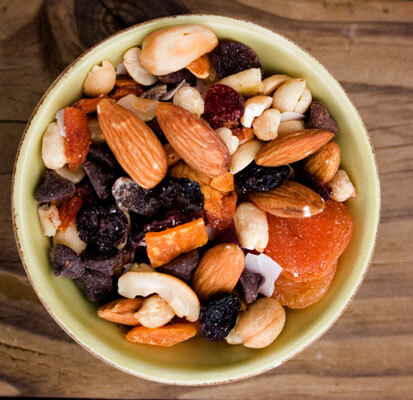 Trash trail mix and ditch dried fruit. Trail mixes are great lab experiments for growing bacteria and fungus because nuts, especially peanuts, grow mold and fruit provides a sugary meal for bacteria. This fact is especially true of the big bags that the whole family puts their unsterilized hands into. And the bulk bins at the store are worse; who knows who’s been ignoring the signs and dipping in for a snack? The germ factor aside, the foods that make up trail mix can cause problems on their own. Nuts can produce gut-irritating shards if you don’t chew them completely and thoroughly. The sugar in dried fruit draws fluids into the intestine and can cause a flushing of diarrhea because your body doesn’t distinguish fruit sugar from plain old sugar. Plus, some dried fruit still includes fruit skins, which are high in insoluble fiber and irritating to an IBS gut. Marooning MSG and other unpronounceable ingredients. Granted, the acronym MSG is pretty pronounceable, but try saying its full name (monosodium glutamate) five times fast. When it comes to monitoring IBS-safe ingredients, if you can’t say it, you can’t eat it! Okay, that’s a bit extreme, but honestly, the harder an ingredient is to pronounce, the more likely it is to be so chemically souped up that your intestines won’t be able to handle it. Caffeine is a stimulant, as coffee drinkers the world over can attest; unfortunately for folks with IBS, their bowels are what get stimulated. 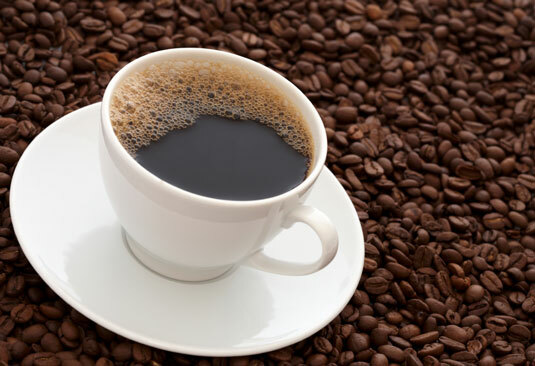 Caffeine irritates the intestines, acting as a laxative for some people who just don’t need that interference. Watch out for hidden sources of caffeine; you know coffee and soda, but don’t forget about energy drinks. No science currently indicates that alcohol triggers IBS, but there’s common sense. Drinking too much alcohol can have a direct impact on your GIT, causing nausea, vomiting, and diarrhea. Forget fast food sauces, condiments, and gravies. 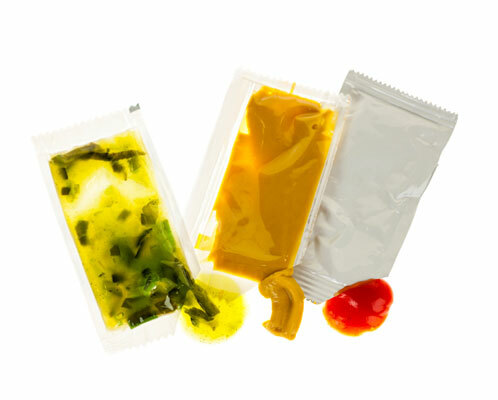 You can be sure that most fast food sauces and gravies are land mines for IBS — they have ingredients that aren’t even labeled, including MSG, aspartame, colorings, dyes, emulsifiers, and all kinds of other awful stuff. This holds true for not-so-fast food restaurants as well. Many popular chain and privately owned restaurants use mixes for their gravies and sauces to save time in the kitchen. And check to see if your local diner actually mashes real cooked potatoes or adds milk to a powdered mixture. Flip the switch on fatty foods. 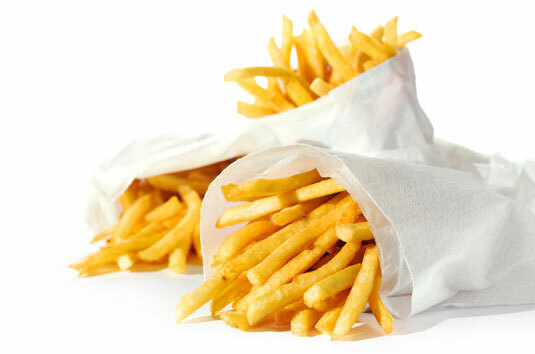 Fat in food naturally stimulates intestinal contractions to help move your meal along from one end to another. It also stimulates the release of bile from the gall bladder to digest the fat in the small intestine. Both actions are necessary for food digestion and absorption, but in a sensitive gut that can trigger diarrhea and/or cramps.